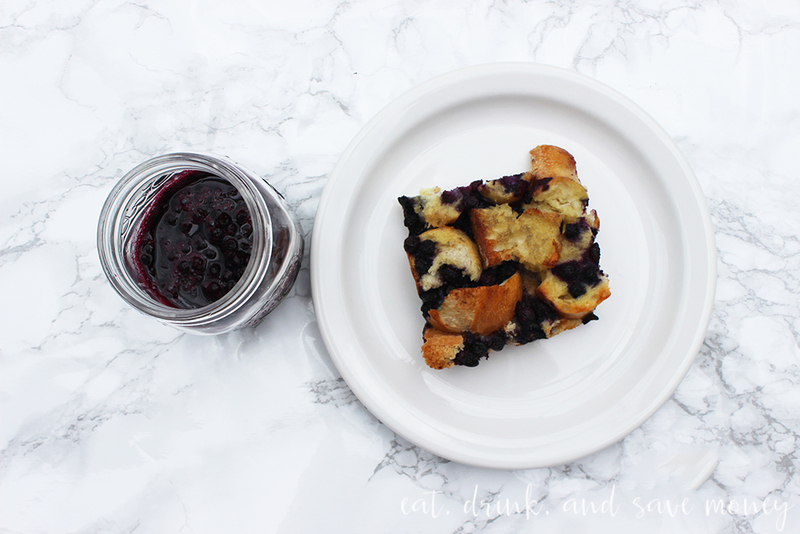 French toast casserole is the perfect brunch recipe. It’s always a crowd pleaser, while simultaneously being an easy dish for the host to put together the day before. 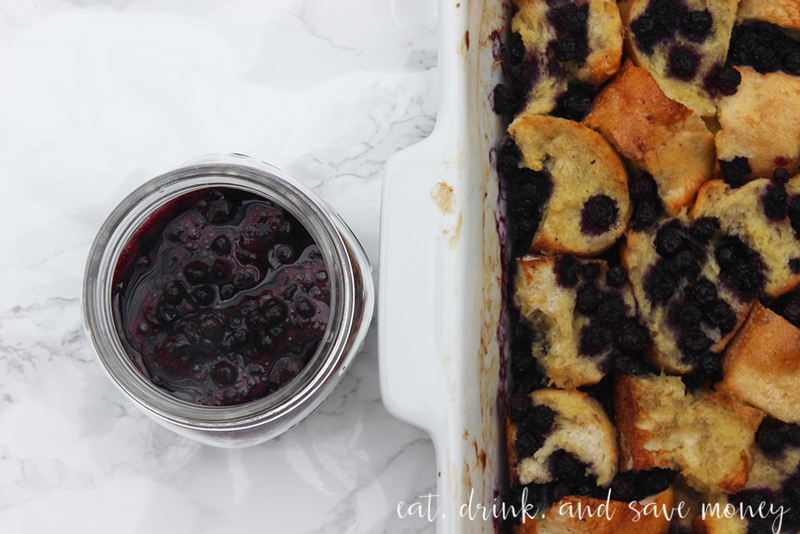 Baked French toast casserole is one of the best ways to enjoy effortless entertaining for busy holiday mornings or brunches. 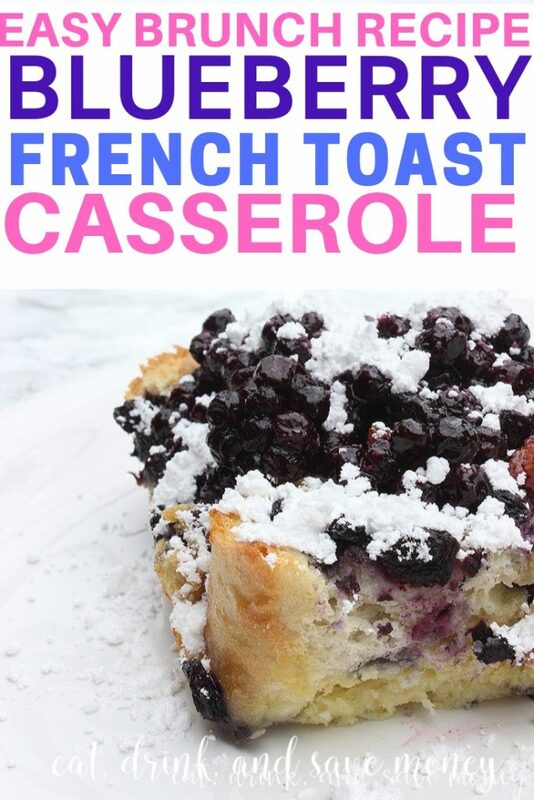 Throw some blueberries in it and you’ve got yourself a dish that will have everyone coming back for seconds and asking for the recipe. I’ve been known to say that I don’t like quick and easy meals. Since the process of cooking is actually enjoyable for me, I don’t actually love throwing together a quick and easy meal. What I do love is a meal that is easy to prep the day before. The kind that can be thrown into the oven 45 minutes before guest arrive, and leaves the house smelling like I’ve been slaving away in the kitchen all morning. French toast casserole is exactly that kind of dish. Like most breakfast casseroles, French toast casserole is best prepared the day before. I tend to make it after the kids go to bed. Then I cover it in foil and let it sit overnight. I’m still able to enjoy the process of putting the dish together without having to spend hours in the kitchen to cook the day that I’m entertaining. Every home chef should play around with French toast casserole. It’s such an easy dish that always impresses guests and family members. If you’ve never tried it, now is the time to prepare this amazingly easy brunch recipe. The flavors in this casserole are probably my all time favorite combination when it comes to sweets. 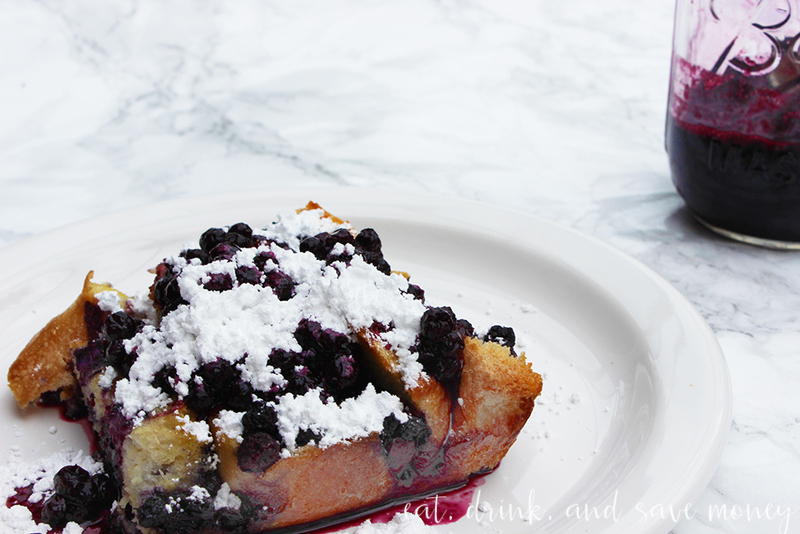 You can’t go wrong with butter, eggs, sugar and blueberries. I’m not a huge sweets fan, but this dish is one I can devour in minutes. I’ve been making savory breakfast casseroles for my entire life. Give me all the sausage, bacon, cheese, and hot sauce. While I prefer the carnivore version of this dish, I love switching to blueberries for Easter brunch and summer get togethers. There is something about spring that makes me want to ditch the meat and eat all the blueberries. This dish came together a few years ago when I entered my first (and only) recipe competition. It came as a huge surprise when I won! Winning finally gave me the confidence to develop recipes and call myself a food blogger. My original recipe called for croissants. This recipe, however, uses a baguette. 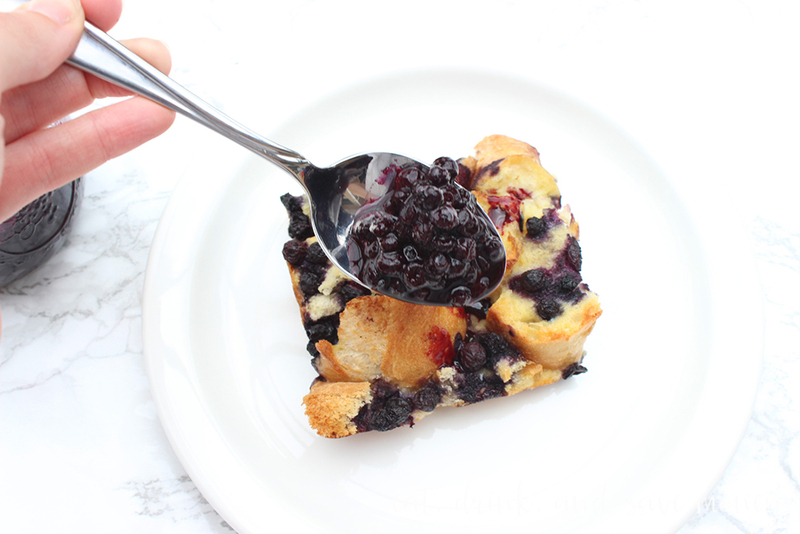 We often have one left over, and since I hate food waste, I wanted to use it up in my French toast casserole recipe. It’s crazy how changing the bread makes such a difference. This version is sturdier and holds up to the sauce much better. I cut the bread into bite size pieces and placed them in a buttered dish. Check out the full recipe at the end of this post. 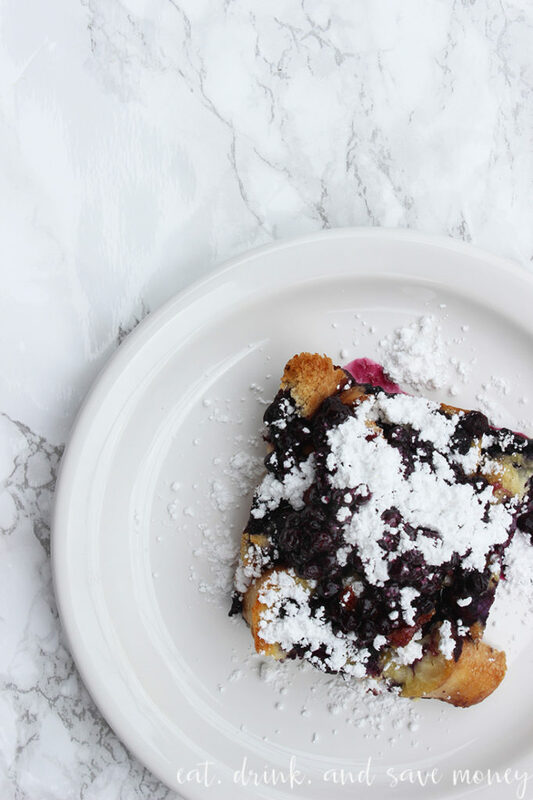 While I don’t mind changing the bread to make a slightly different spin on my blueberry French toast casserole, there are 2 ingredients that I’ll never change. The first is the addition of almond extract. While it tastes perfectly fine with only vanilla, the almond adds a wow factor. The second ingredient that I can’t imagine changing is wild blueberries. It’s imperative that you use wild blueberries. Usually I say that fresh is best, but in this case I have to use frozen ones. Wild blueberries are only found up north, nowhere near my Florida home. You can find them at most grocery stores in the frozen aisle. Now it’s time for that recipe! Here it is. I hope you enjoy this as much as my family does. Cut baguette into bite size pieces and place in baking dish. Beat eggs, milk, sugar, vanilla and almond extract in a medium mixing bowl. Pour evenly over bread, spooning mixture over the bread if needed. Cover and refrigerate overnight, for at least 5 hours. Add frozen wild blueberries on top before baking. Push them down into the bread. Sprinkle powdered sugar on for an extra treat! I love breakfast. I can’t imagine a day without it. I am not a big fan of french toast, but this sounds delicious!! It is! I never tend to order French toast when I’m out, but I love this dish. It’s like a sweet strata. This looks positively scrumptious! I finally have found a good recipe to use all of my frozen fruits on! I bet it would be nice with other frozen fruit too! I should try strawberries next. This looks amazing!!! It would be perfect to serve my out of guests this week…YUMM! Lol! Got it. Yes, it is perfect for guests. This looks sooooo Delicious! Just, yes! Also, I’v never made a French toast casserole before, but what an excellent idea! I really like wild frozen blueberries as well, they are perfect for baking. They really are the best for baking. I love how sweet they are! They pack a good punch in a tiny fruit. I have one last giant gallon size freezer bag of fresh picked blueberries from last year that I’ve been wondering what to do with… I think we’ll be trying out a new recipe this week! Pinned. Ohhh! Let me know how it turns out!